The main goal of this collaborative pilot project has been to work with local stakeholders in Iqaluit to develop a tool for evaluating how local research messages are exchanged and used by policy actors in Iqaluit and Ottawa. To do this we have developed a two-step approach: 1. we have created a network map, informed by social network analysis, illustrating the policy actors who have received a country food security message disseminated by the Qaujigiartiit Health Research Centre (QHRC) in Iqaluit; and 2. we interviewed some of these decision makers to learn more about how they use this message in their jobs. We found that this two-step approach is necessary to be able to first identify ‘message users’ and then to understand how these policy actors are using a local research message to address the issue of country food security. We are excited to announce the release of our guide to knowledge tracking. This diagnostic tool outlines how community-based research groups can track the exchange and use of a local messages across multiple policy scales drawing on techniques in social network analysis and content analysis. Through this work I am now associated with a large network of colleagues who are interested in building local research and evaluation capacity in the area of environmental health knowledge translation. 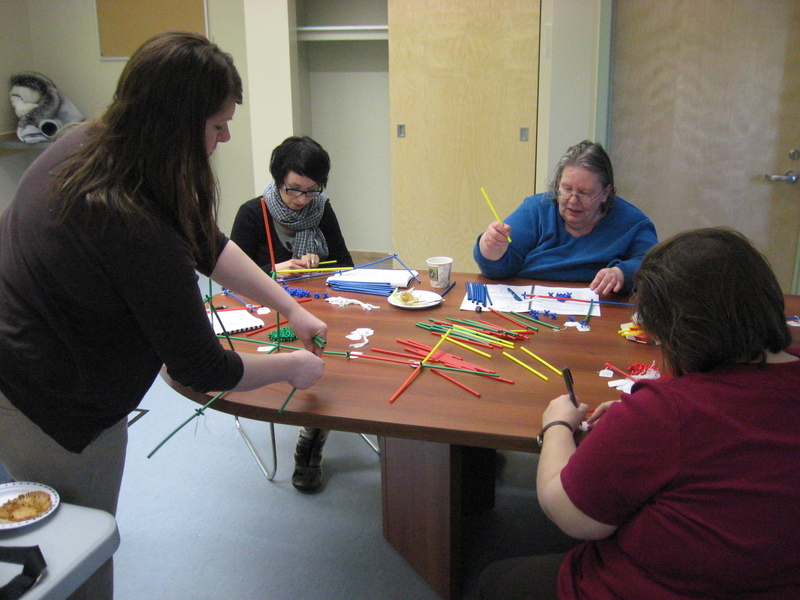 Building personal communication models using straws and connectors in Iqaluit. Aullak, sangilivallianginnatuk (Going off, Growing strong) is the first project of its kind in Canada focused on bringing together youth and harvesters to improve a community freezer program. The overall goal is to help build the resiliency of a group of youth in the face of widespread social, environmental, and cultural change. This pilot project is about building connections (social and environmental) and evaluating the success of a community freezer and pilot youth outreach program that aims to enhance the mental, physical, and spiritual health of a group of youth in Nain, Nunatsiavut. This first group of ten youth started the program in March 2012 and have recently completed the program becoming Junior Harvesters. We have been monitoring the success or ‘impact’ of the pilot program through: stakeholder engagement, formal outcome assessment, and rigorous documentation and tracking of program activities. Program evaluation and reflection is currently being carried out together with program staff and a community-based steering committee. In 2012, I was able to live my research by residing in Nain where I helped guide program and evaluation planning and engaged in the study of evaluation techniques for community-based health interventions. 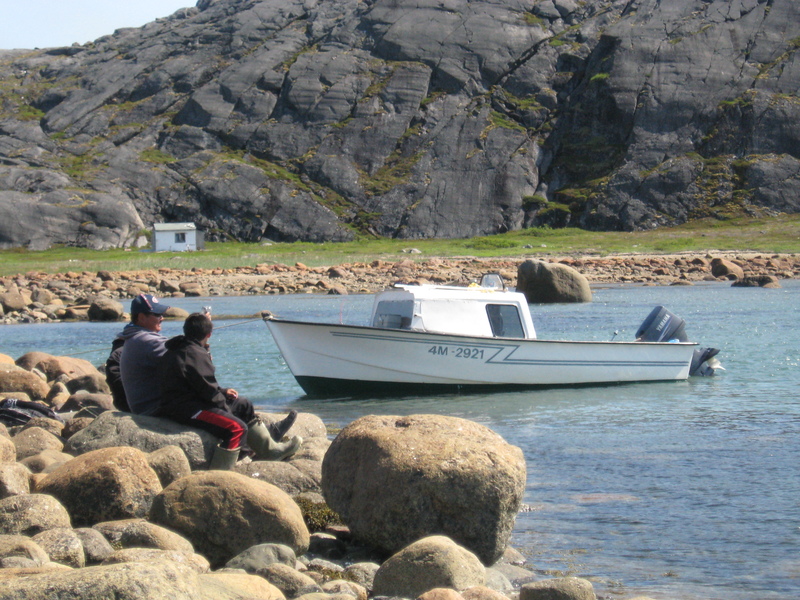 Out on a trip as part of the Nain Community Freezer Youth Outreach Program. 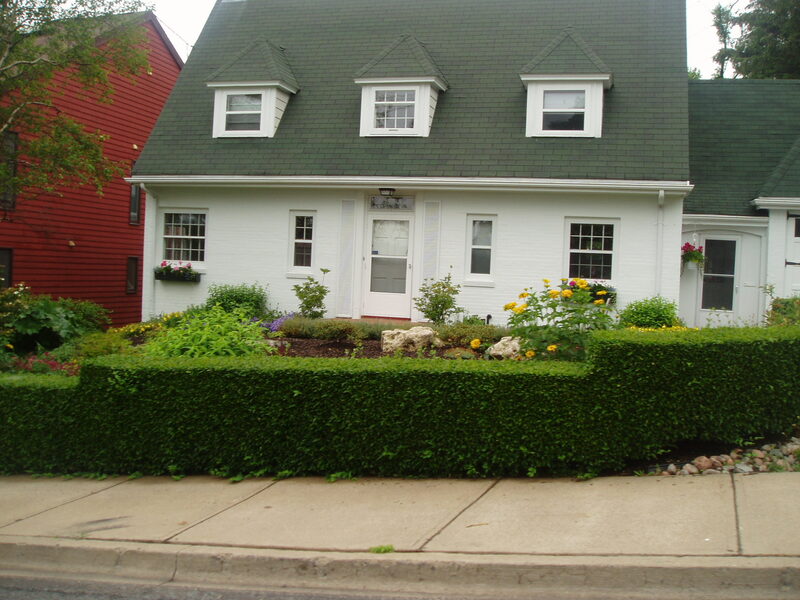 My doctoral research is grounded in health and hazards geography with a particular interest in the social-cultural context of everyday decision-making about risky behaviours such as residential pesticide use. Questionnaire surveys of Calgary, Halifax, and London residents analyzed using multivariate techniques, reveal that social context variables such as the presence of a weed-free aesthetic or a desire to avoid conflict are as important in determining policy preferences as health risk perception factors. This highlights the need to focus environmental health policy analysis at the grass roots, in people’s everyday lives; rather than, from the top down. Further in-depth inquiry using narrative policy analysis of qualitative interview data illustrates that, although residents are generally divided about the appropriateness of pesticide bans, they are more concerned with balancing perceived aesthetic and health risks in order to get along in the neighbourhood context. Additionally, residents generally agree with the reduction of non-essential pesticide use and are open to alternatives to chemical pesticides. This indicates that municipal policy-making about pesticides must be sensitive to the complexities inherent in the yard as a socially contested space. Thus, the success of environmental health management at any level may depend on our understandings of the “social” at the local level.